Feeding your cat a nutritious, healthy, and balanced diet can help to increase the nutrients that they can absorb, and it can also help to keep their digestive system regular. The best cat food for constipation is an essential part of their diet if they routinely have problems with their digestive health. Not only are we going to give you five different choices that are very good for constipation, but we're also going to give you a place to review them side by side. Our short guide will also tell you what's important to look for in this food, why you may want to consider getting it, and more. 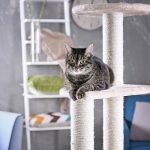 What is Constipation in Cats? In a perfect world, your cat would never have trouble going to the bathroom. However, constipation is a very common problem in cats, and you'll most likely experience it with your cat at one point or another. Some cats have chronic issues as well. 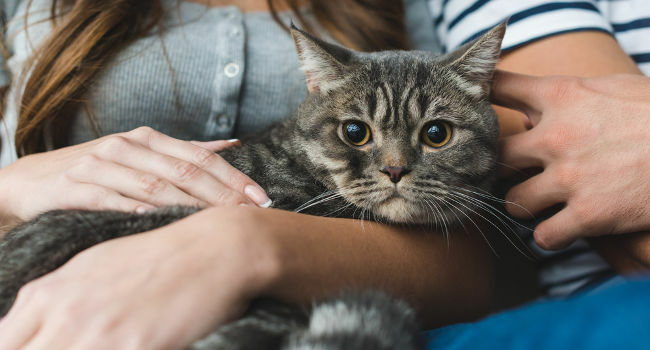 If your cat has constipation, they have an abnormal buildup of feces in their colon, and this buildup makes it very difficult for your cat to pass the feces when they try to go to the bathroom. Feces that build up are often dry, and this adds to the difficulty that your cat experiences. When your cat starts to strain, they may pass small amounts of liquid feces and blood or mucus. This doesn't mean that they have a bowel movement, and they may remain constipated for days. If it gets too bad, your veterinarian may have to manually remove the feces or give them laxatives to try and soften it. Colon Obstruction - Cats that have hernias or tumors in their colons may cause an obstruction. This obstruction makes it difficult for your cat to go to the bathroom, and it can turn into constipation. Dehydrated - Ideally, your cat should drink 3.5 to 4.5-ounces of water for every five pounds of body weight per day to stay hydrated. If your cat doesn't get enough water, it can make their poop very hard and dry. Dirty Litter Box - Cats like to have a clean litter box to go to the bathroom in, and they can avoid it if you don't keep it clean. This can cause a buildup of feces that compacts and gets too hard for your cat to pass. Fiber Deficiency - Cats require fiber to help keep their digestive systems regular and functioning at peak levels. If your cat doesn't get it from their food, you may notice them having difficulty when they try to go to the bathroom. Medication Side Effects - If your cat takes medications or antibiotics, it can cause problems with their digestive system. Constipation is a common side effect of many medications, and it should clear up when they finish with their round of antibiotics. Obesity - Obese cats can have difficulty regulating their bowel movements, and this can result in diarrhea or constipation. These problems can get worse as your cat continues to gain weight. A good fiber content is essential for helping to regulate your cat's digestive system, and you should see it on the label when you look. Pumpkin puree, lentils, chia seeds, flaxseed, cat nip, and cat grass are all great sources of natural fiber that can kickstart your cat's digestive system. Healthy fats help to support your cat's digestive system, healthy skin and coat, regulated metabolism, and healthy brain development. You want to see things like Omega fatty acids because these are the things that give your cat energy throughout their lives. Your cat's food should have a higher protein content that comes from quality sources like salmon, turkey, lamb, or chicken. Since cats are carnivores, this protein content will help to prevent the buildup of hair or feces in your cat's colon. You could try adding wet food into your cat's diet because it has a very high water content that helps to ease your cat's constipation. You can also add water to your cat's dry food to help as well. Aloe Juice - Aloe Vera juice works by adding around a half of a teaspoon into your cat's food. You do want to consult with your veterinarian before you do this because this can cause diarrhea very quickly with cats. Pumpkin Puree - Pumpkin has a higher fiber content, and it also comes with a very high moisture content. You can mix one or two teaspoons into your cat's food up to twice a day to help relieve their constipation. However, it may come back if you stop adding it in. Blue Wilderness's adult cat food comes in five different sizes and two different flavors including salmon and chicken. Real meat is the first ingredient on the bag, and it contains a lean protein source for healthy weight management. This formula has a high amount of fatty acids that help to support nourished skin and a healthy, shiny, and soft coat. The higher fiber content ensures that your cat's digestive system stays regular when they eat, and this can help prevent constipation and diarrhea. The kibble comes enhanced by Blue's LifeSource Bits, and these LifeSource Bits contain an essential blend of antioxidants, vitamins, minerals, and nutrients to support total system health. There is no chicken or by-product meals, wheat, soy, corn or artificial colors or preservatives for a healthier formula. Cat parents who bought Blue Wilderness's food liked that it had higher dietary fiber and LifeSource Bits that helped to support their cat both internally and externally. Cat parents did mention that this food has kibble pieces that are smaller and harder than other kibbles, and this can make it difficult for older cats to eat. This food comes in three different sizes, and you get both chicken and salmon flavors to keep your cat interested. It comes with a unique blend of antioxidants and minerals that help to support your cat's immune system and digestive system. The digestive fiber in this formula ensures that your cat's digestive system stays regular, and it helps to avoid constipation or other issues. Your cat can eat this food throughout their lives from a kitten up to a senior without lacking in any nutrients or vitamins. This food supports healthy growth, lean muscles, healthy brain development, strong immune system health, digestive health, and more throughout your cat's life. The smaller kibble is easy for cats of all ages to pick up and eat without having a problem, and the kibble shape is ideal for a cat's mouth. 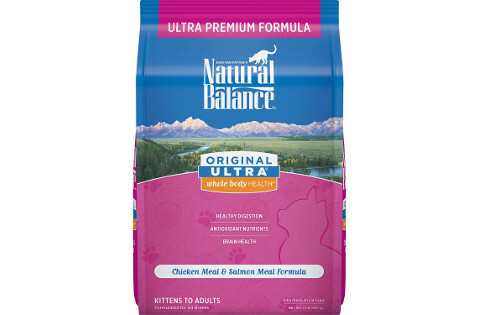 Cat parents who bought this dry cat food for their pet were pleased that this food comes with both chicken and salmon in the formula to help keep their cat's interested. Cat parents did note that this food may not be gentle enough for cats who have more sensitive systems. This wet cat food comes with a rich protein source from turkey and liver, and this also gives the food a lean protein source to help manage a healthy weight. It has DHA, and this helps to support eye and brain development. 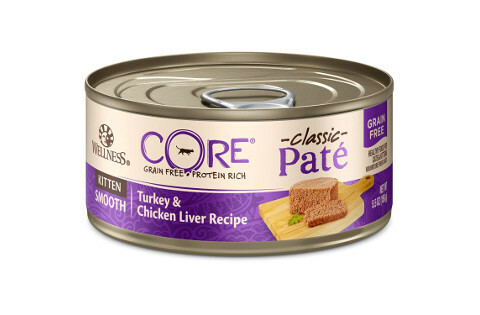 The pate form of this food is easy for cats of all ages to eat, and it contains a high level of antioxidants that help to support cell health. There is no corn or soy in this formula, and this makes it easier for your cat to digest every time they eat it. There are vitamins, minerals, and probiotics in this food, and they help to support a healthy immune function, regular digestion, a healthy skin, and coat, and joint health. You can choose from two different sizes, and this allows you to customize your order to your cat's needs. Cat parents who bought this wet cat food for their cat liked that it has a higher protein content from liver and turkey and that these things are the first two ingredients. Cat parents didn't like that this food has a slightly stronger smell when you open the can. 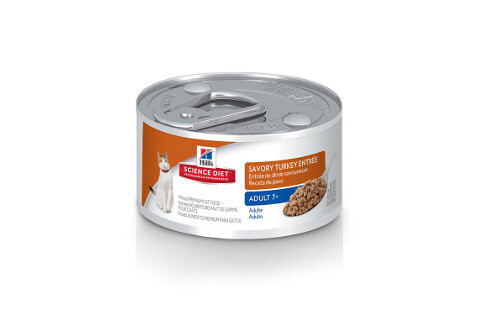 This savory turkey entrée has a soft and smooth texture that is easy for your senior cat to eat, and it's specially formulated for cats aged seven and up. The quality ingredients are easy for your cat to digest and absorb the nutrients from. The formula in this cat food help to support your cat's kidneys and vital organs as they age and all of the ingredients combine to create a flavorful food that keeps your cat interested. This food helps to build lean muscles and support healthy joints as your cat ages. 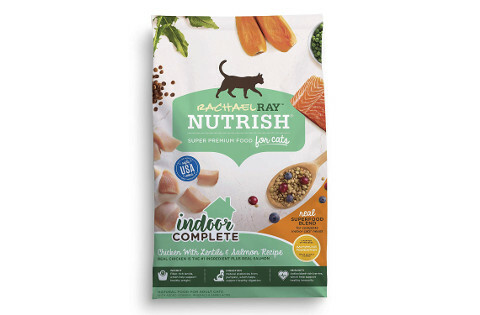 The antioxidants and nutrient content in this food work to increase your cat's immune health and the fatty acids help to keep your cat's skin and coat healthy. Finally, you can choose from two different order sizes to customize your order to suit your cat's dietary needs. Cat parents who purchased this cat food for this senior cat were happy that it had a smooth and soft texture that was easy for their cats to eat. Cat parents who purchased this cat food were not happy that this food didn't have a higher vegetable content. Rachael Ray's food has real chicken as the first ingredient, and salmon is also one of the top ingredients in this food. Your cat will get a balanced blend of superfoods like blueberries and cranberries that helps to provide balanced nutrition. The lentils in this formula are very rich in natural fiber, and this helps to regulate your cat's digestive system and prevent constipation. It also contains pumpkin and dandelion greens along with probiotics to improve digestion and improve nutrient absorption. The antioxidant content in this food ensures that your cat has a strong and healthy immune system throughout their lives, and there is no fillers, wheat, soy, or corn in this food. The kibble is slightly smaller and optimally shaped to make it easy for your cat to pick up, eat, and digest. Cat parents who purchased this dry cat food for their cats were happy that it contains superfoods and a high source of probiotics and fiber for optimal digestion. Cat parents did say that this cat food had a stronger smell associated with it that tended to linger around the food. What's the Best Cat Food for Constipation? 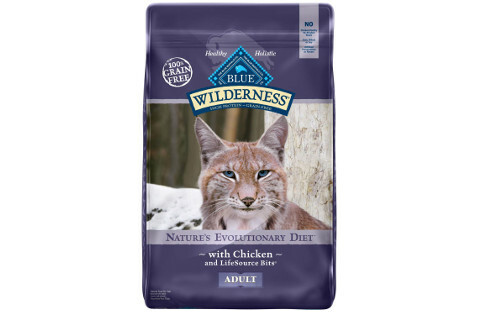 Our pick for the best cat food to prevent constipation is Blue Buffalo Wilderness Natural Adult Dry Cat Food because it contains a higher level of fatty acids and antioxidants to support optimal health. It has Blue LifeSource Bits that provide a boost of extra nutrients each time your cat eats it. We also picked this food because it comes in either chicken or salmon flavors as the protein source, and these lean protein sources help to support an optimal weight and healthy development. Finally, Blue Wilderness has a reputation for using quality ingredients from trusted sources in all of their food.